John McCain – A Complete Fraud & The Obama Administration Took Bribes From Iran? If you follow the deep-state political war taking place in American government, you know that the stakes are huge for both sides. It is vital for the Republic that Trump succeed in exposing, charging and arresting the arch criminals in our government. I thought that, as an example, I would share with you two examples of the fraud and treachery that we have been victims of. One is Senator John McCain. When I was a neocon 15 years ago, McCain was one of my heros. I was “All in” for the Project For A New American Century, and in agreement that we should conquer the middle-east. But I gave that nonsense up a few years ago when I realized that the whole of US government was profoundly corrupt, in the most satanic fashion. Example One – John McCain, sold to the voters in 2008 as the ultimate American hero. Below is his promotional video, aired at the Republican National Convention in 2008, when McCain was nominated to run for President on the Republican ticket with Sarah Palin as his VP. Remember watching this and thinking McCain was perfect for President? He was the first psychiatrist ever to receive a PhD. focusing on international relations, and is the only psychiatrist to ever have served as a Deputy Assistant Secretary of State. He served four presidents as Deputy Assistant Secretary of State under Nixon, Ford, Carter, and Bush Sr. and was a Senior Policy Planner under president Reagan. Dr. Pieczenik worked directly with, and reported directly to, Secretaries of State Henry Kissinger, Cyrus Vance, George Schultz and James Baker, as well as the respective White Houses. Dr. Pieczenik was drafted into the Vietnam War. He was assigned in the Public Health Services with the rank of Navy Captain (0-6) to run three psychiatric wards at St. Elizabeth’s Hospital in Washington, D.C., including a ward where serial killers were housed. He was subsequently offered a promotion to Rear Admiral (0-7), which he refused on the grounds that he felt honored enough to serve his country, did not want to take a pension and wished to return to civilian life to follow his passions as a physician, entrepreneur and novelist. Watch this and see who McCain really is. We have been played for fools all our lives. 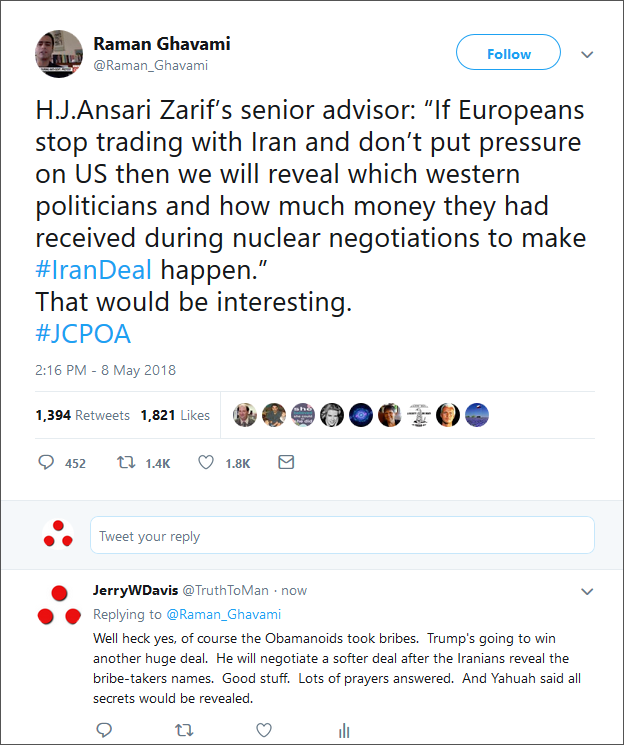 The Iranians are threatening to release the names of the Obama officials who took bribes in order for Iran to win the huge (billions of dollars) payout regarding their nuclear options. All the secrets are being laid bare, just as Yahuah promises. I am awaiting with anticipation on the release of names and expose the greedy, evil people they are. You and me and a few million other folks, Susan. Think anyone will go to jail? Thank you Jerry for the link to Dr. Pieczenik. You are welcome, Robin. Did you listen to his video on McCain? It took Trump getting into office to show McCain’s true colors. A man that many of us respected proved to be a deception, sad. It is apparent that the lies are being exposed everywhere, Denise. Do you think Obama will eventually be proven a fraud, a non-eligible president?